Since I repeatedly took pictures of this striking bronze at the museum I decided to put all pictures together. My equipment has improved in the meantime, and the statue has been moved, so you will notice differences. To some it will be very repetitive, to others it will be like walking about and seeing the statue from different angles. 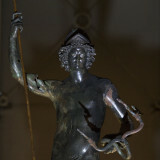 Statue of Mars. He has in one hand a spear (gone), in the other a flower. As such he symbolizes both the destructive quality as the god of war, and the fertile aspect that he also possessed. From the Enc. Britt. : ancient Roman deity, in importance second only to Jupiter. Little is known of his original character, and that character (chiefly from the cult at Rome) is variously interpreted. It is clear that by historical times he had developed into a god of war; in Roman literature he was protector of Rome, a nation proud in war. Mars's festivals at Rome occurred in the spring and the fall--the beginning and the end of both the agricultural and the military seasons. 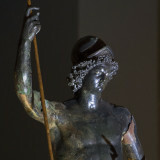 The month of March was especially filled with festivals wholly or partially in his honour; the members of the ancient priesthood of the Salii, who were particularly associated with Jupiter, Mars, and Quirinus, came out several times during the month to dance their ceremonial war dance in old-fashioned armour and chant a hymn to the gods. October was also an important month for Mars. At the festival of the October Horse on October 15, a two-horse chariot race was held in the Campus Martius, and on October 19 the Armilustrium marked the purification of the arms of war and their storage for the winter. The god was invoked in the ancient hymn of the Arval Brothers, whose religious duties had as their object to keep off enemies of all kinds from crops and herds. A picture was used for the cover of a book.